Lt Kelso Horne - 508th P.I.R. The G.I. 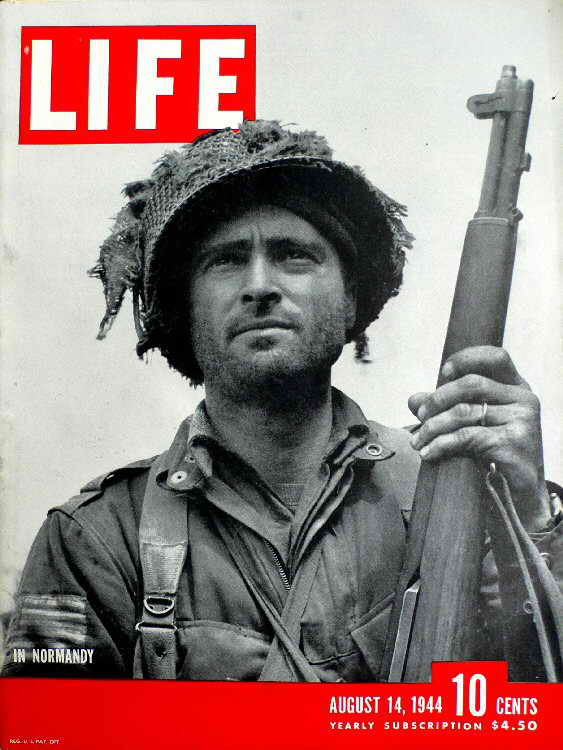 On The Cover of Life Magazine, August 14th 1944, was 81 years old when he was Interviewed about how he became the face on that issue of Life Magazine at that time. He still remembered the exact time - 02.06 a.m. - when he leapt from his transport plane on D-Day. "Most people, only think of D-Day on the big anniversaries, like the 40th or 50th," said Kelso Home. It comes to my mind every June 6th and on a lot of other days too. Kelso was a second lieutenant in the 82nd airborne division when he parachuted into Normandy. He landed alone in a field, so nervous and frightened that he hurriedly cut away his parachute harness and with it his bag of rations, socks and underwear. With other Americans, he spent D-Day skirmishing with Germans and trying to gather men from his platoon, they were scattered badly during the airdrop. About a week later, he was at the head of an infantry column advancing on a German-held town. This staff car came up alongside us and a General asked where we were going. While the car had stopped a guy got out and says to me, "I WANT TO TAKE YOUR PICTURE." I said, "well go ahead, and take it then." I looked into the camera and he said to look away, and when I did he took it. He asked my name and the town where I came from and then they left. I didn't think much of it. Back home in Dublin, Georgia, his wife, Doris, was taking care of the couple’s month-old son, Kelso Jr. The post office called her at 6 a.m. the day Life magazine arrived. When she saw the cover she said," I thought he was the best looking one in the whole business." She also was glad to see his wedding ring in the picture. It was a standard joke among wives that men took of their wedding bands on the way over to Europe and put them back on, on the way back. After the war Kelso worked for the postal service until his retirement. In 1992 Kelso was at Fort Benning for the graduation of a grandson, Kelso III, who followed him into the airborne. Kelso Horne pinned his old paratrooper wings on his grandson during the ceremony. Sadly, LT Kelso Horne passed away on the 25th November, 2000, aged 88.